This easy Lemon & Roasted Garlic Hummus Recipe will become your go-to hummus recipe. Perfect with chips, veggies or as a sandwich spread! Hummus is no stranger to my kitchen. Especially in the spring and summer months, when fresh produce can be found just about everywhere, there always seems to be a batch ready for dipping in my fridge. It’s one of the things my girls will eat without hesitation – and they’ll eat it with the veggies, so it’s a win-win. This Lemon and Roasted Garlic Hummus recipe is one of their favorites, so I tend to make this one most often. Don’t shy away from this roasted garlic hummus recipe because of the extra step of roasting the garlic, either. Yes, it takes an extra 45 minutes to get ready, but most of that is cooking time and roasting garlic is easy! I told you how to do it last summer and even gave you 25 ways to use it…so if you’re not roasting it by now, what are you waiting for?? 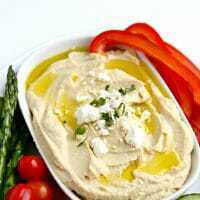 It’s so good and it’s fantastic paired with the lemon in this easy hummus recipe. Also…if you have a Vitamix (or other high-powered blender), this is what it was made for. You can’t get hummus this smooth and creamy at home, so if you’ve been on the fence about picking one up, now is the time. 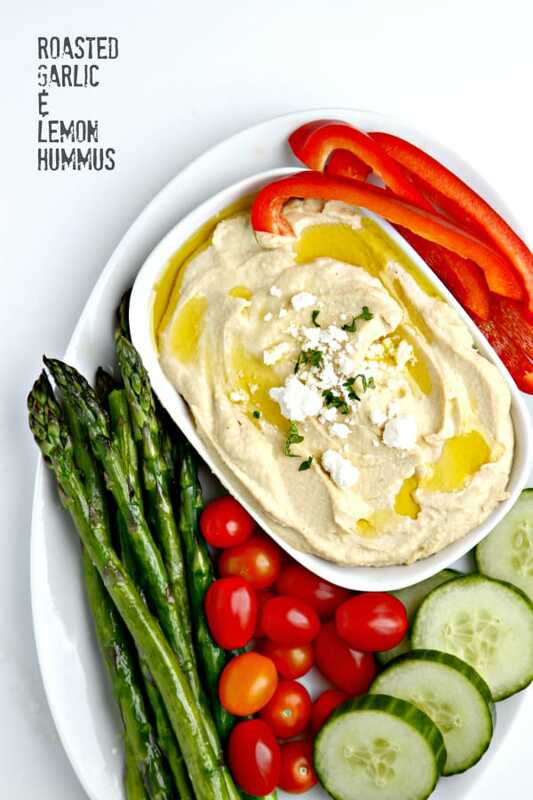 I like to serve this lemon and garlic hummus recipe with some fresh, crunchy vegetables and pita chips. I love roasted asparagus with it, too, although I undercook it just a smidge so it still has plenty of crunch to it. This makes a killer sandwich spread, too (I’m making a roasted veggie sandwich with it tomorrow, can’t wait)! Although this Lemon and Roasted Garlic Hummus recipe is my current favorite, I’ve been playing around with a Black Bean Hummus recipe with roasted jalapeños…that one is thisclose to being perfected!! Talk about a killer sandwich spread – that’s one you won’t want to miss! Cut the top 1/2 inch from garlic bulb (straight across the top so you cut into just the tops of the cloves). Place garlic bulb in a ramekin, drizzle with olive oil and cover with foil. Roast for 30-40 minutes or until garlic is very soft and lightly browned. Remove from oven and allow to cool. Squeeze garlic out of its skin and add to blender. Add garbanzo beans, a couple tablespoons olive oil, lemon juice and tahini. Pour in a small amount of reserved liquid from the beans, then pulse on high, adding more liquid as necessary until blender can run continuously. Blend until very smooth, adding additional liquid until you reach desired consistency. Season with kosher salt and freshly ground black pepper. Place in refrigerator to chill or serve immediately (flavors will continue to develop as it sits). 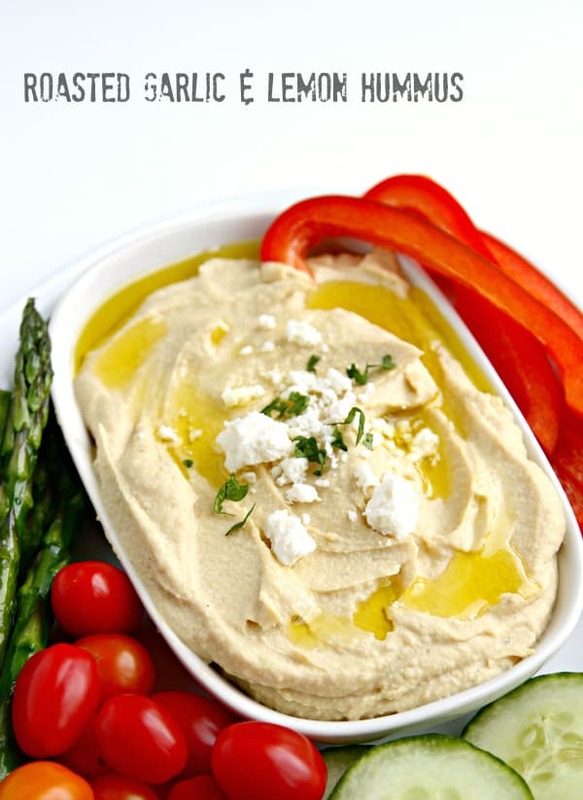 Put hummus in a serving dish and spread out with a spoon (no need to be perfectly smooth). Drizzle with a little olive oil, sprinkle on some feta cheese and serve. Prettiest hummus ever! I love making my own. And I heart all. the. lemon. things! HAPPY HUMMUS DAY! :) hummus is one of my favorites, every day is hummus day at my house. and this is the way I like it, lemony and with plenty of garlic. This looks awesome! I love roasted garlic ANYTHING, and this sounds like a great way to enjoy it! Love that you added an entire head of garlic – that means a whole load of flavor!